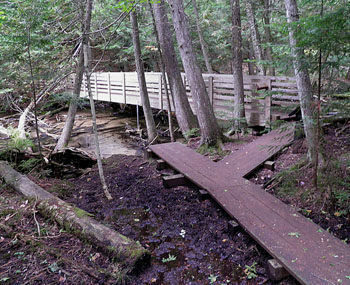 McCune Nature Preserve is a beautiful 168-acre tract located east of Petoskey in Emmet County. Originally homesteaded by Allan Purchis, the property was donated to the Little Traverse Conservancy in 1984 by Allan and Virginia McCune of Petoskey. Harwood forests dominate the terrain but McCune also contains red pine plantations, open meadows and cedar swamps. The preserve’s most impressive feature, however, is its 3,400 feet of frontage along Minnehaha Creek. The spring-fed stream flows 10.5 miles from near the Emmet/Charleviox County border north to Crooked Lake, splitting McCune in half along the way. Its cold, clear waters support a brook trout fishery. 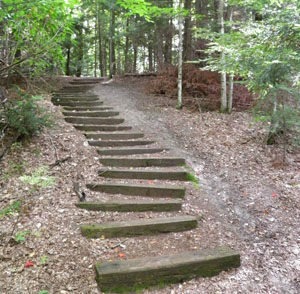 Winding through the preserve is a 2.4-mile network of trails that are divided into three loops. Departing from the trailhead are Hardwood Hike Trail, a 0.8-mile loop, and Minnehaha Trail, a 0.95-mile loop. Connected to Minnehaha Trail in the western half of the preserve is River Ridge Trail, a 0.7-mile loop. 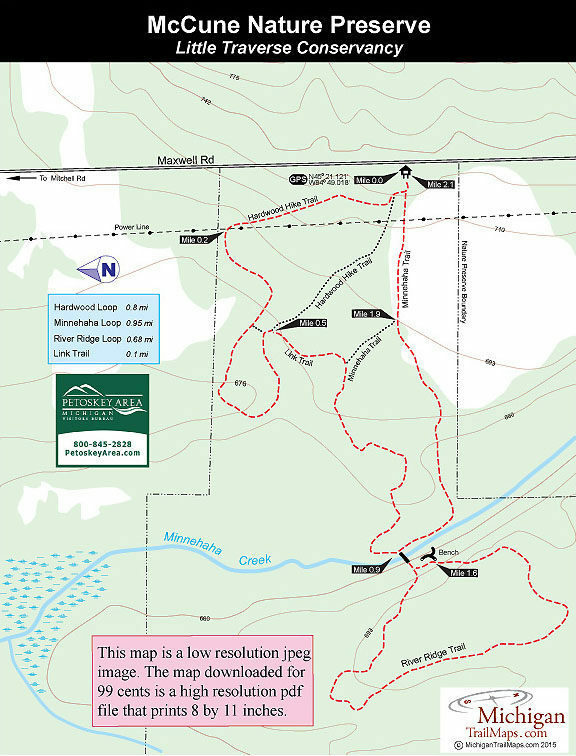 The route described below follows the perimeter of the trail system for a 2.1-mile outing. The trails, many of them former two-tracks cut by loggers, are easy to follow and well marked. In the winter they are well suited for snowshoeing and backcountry cross-country skiing but are not groomed. The parking area is plowed but keep in mind that the entrance is on a slope and can be slippery at times. From the parking lot the trail heads west and quickly arrives at a posted junction. Head north (right) to follow Hardwood Hike Trail. Within a quarter mile from the trailhead you’ll pass underneath power line and then come to a series of posted junctions. 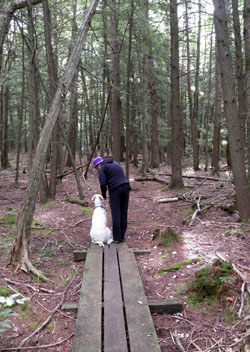 The first one, reached at Mile 0.3, leads to a short link that shortens Hardwood Hike Trail by a quarter mile. The third junction marks where Hardwood Hike Trail returns to the parking area and the Link Trail heads right for Minnehaha Trail. You’ll merge onto the next loop at Mile 0.6 and then follow a long boardwalk through an interesting cedar swamp before arriving at Minnehaha Creek at Mile 0.9. The gurgling trout stream is best viewed from the bridge that crosses it. Patches of gravel are scattered along the sandy bottom of the creek and are good places to look for trout, especially late in the day. The bridge provides access to the River Ridge Trail, a 0.7-mile loop on the west side that ends at a log bench perched above Minnehaha Creek. If there are any snacks in your daypack, this is an excellent spot to enjoy them. You re-cross the foot bridge and head south (right) on Minnehaha Trail, where you enter an open meadow and at Mile 1.9 reach a posted junction. Stay right and within a quarter mile will merge into Hardwood Hike Trail just before arriving at the parking lot. At the entrance of the preserve is a small parking area and an information display. There are no vehicle or entry fees to hike at McCune Nature Preserve. From US-31 in Petoskey, head east on Mitchell Road east 7.2 miles to Maxwell Road. Turn south (right) on Maxwell Road and the signposted entrance to the preserve will appear in less than a mile on the west (right) side of the road.